Plan renovations, oversee staff, and prepare for your next state or CMS survey. 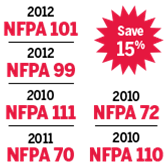 SAVE 15% on six vital NFPA® codes and standards for electrical safety and fire protection in health care facilities. Order this must-have CMS Set for facility managers, electricians, maintenance personnel, and inspectors! Power systems, fire alarms and MNS, emergency generators, and stored energy systems are all necessary to safeguard patients and medical personnel in the health care environment. To help you do your job -- and comply with recently adopted CMS regulations -- the CMS Health Care, Life Safety, and Electrical Codes Set combines the 2012 editions of NFPA 101®: Life Safety Code® and NFPA 99: Health Care Facilities Code, along with the 2011 edition of NFPA 70®: National Electrical Code®, and the 2010 editions of NFPA 72®, NFPA 110, and NFPA 111. Be ready to confidently address electrical safety issues and help meet the new CMS Conditions of Participation (COP) with this Set. The 2011 edition of NFPA 70: NEC® with comprehensive regulations for electrical wiring, overcurrent protection, grounding, and installation of lighting, exit signs, powered doors, fire alarms, elevator controls and lights, medical gas alarms, and other communication and notification systems in health care facilities. The 2010 edition of NFPA 72: National Fire Alarm and Signaling Code introducing an important new scope and revised organization. Besides the core focus on fire alarm systems, this edition adds requirements for Mass Notification Systems (MNS) used for weather emergencies; terrorist events; biological, chemical, and nuclear emergencies; and other threats that could endanger patients and staff. The 2010 edition of NFPA 110: Emergency and Standby Power Systems with requirements for the installation, maintenance, operation, and testing of emergency power systems for building needs and medical systems including patient life support. The 2010 edition of NFPA 111: Stored Electrical Energy Emergency and Standby Power Systems with requirements for Stored Emergency Power Supply Systems (SEPSS) installation, maintenance, operation, and testing. Compliance helps ensure continuous emergency power, since a loss of power in a health care facility could be devastating to patients.